Thick slices of mozzarella, sweet roasted tomatoes, fresh baby spinach, and a smear of pesto get stuffed between two pieces of crusty bread and cooked until gooey and oozing. April is dedicated to melted, gooey cheese stuffed between two pieces of crusty bread that have been buttered and toasted to perfection. It’s National Grilled Cheese Month–also known as the best month ever! The #SundaySupper team has partnered with Gallo Family Vineyards to help celebrate this glorious cheese-filled month with cheese’s best friend: wine. It’s a match made in foodie heaven, and I’m excited to share this roasted tomato caprese grilled cheese sandwich in honor of such a delicious occasion. Gallo let us have free range of their wine selection this month. They have so many wonderful wines to choose from, that I had a difficult time making my selection. Mmm, all of them? I finally decided on their crisp, slightly fruity Pinot Grigio and their bold, berry-infused Pinot Noir to pair with my grilled cheese sammie. Different strokes for different folks, right? While I prefer a fruity white, others may prefer a rich red, so I chose one from each wine grouping. Cheese and wine are in a committed relationship that will never die or go out of style–it’s a timeless classic. There’s no wrong answer when it comes to pairing wine with cheese. Any selection you make is the right selection and will pair perfectly and taste absolutely delicious. That’s the glorious thing about wine and cheese–anything goes! This roasted tomato caprese grilled cheese has quickly become one of my favorite sammies. It’s easy, yet impressive. You can dress it up for a casual dinner party or make it on a busy weeknight. If you’ve never roasted tomatoes, I highly recommend giving it a try. The tomato flavor concentrates as the tomatoes back, creating a sweet, juicy, roasted-to-perfection tomato. Roasting tomatoes is a breeze. Place your tomatoes (I used campari) on a sheet pan and drizzle with olive oil. Sprinkle them with a little kosher salt and pepper. Place them in a 400 degree F. oven to bake for 40 minutes. If you’re using a smaller tomato, like grape or cherry, reduce the cooking time to 30 minutes. Because we’re using roasted tomatoes for this recipe, choosing the perfect loaf of crusty bread is a must. I used thick, chewy ciabatta bread for this recipe. I do not recommend using a flimsy loaf bread, such as white, in this case because of the juiciness of the tomatoes. You want a loaf of bread that can soak up the juice without losing its integrity and falling apart. 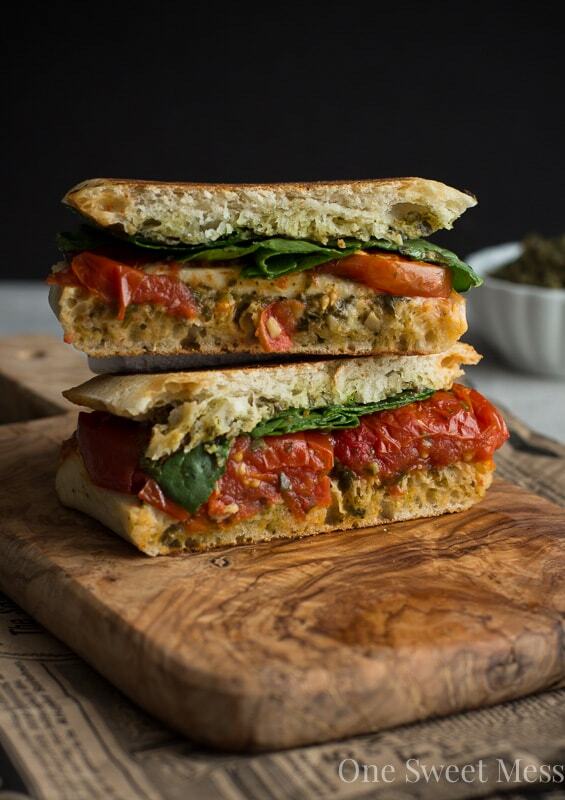 This sammie is piled high with thick slices of mozzarella, sweet roasted tomatoes, fresh baby spinach, and a smear of pesto. The result is a deliciously gooey mess. Find a Gallo Family Vineyards retailer near you with their store locator. To receive updates, follow Gallo on Facebook, Twitter, Instagram, and You Tube. Visit Gallo’s Grilled Cheese blog post and the Cooking with Wine Pinterest board for more wine pairing suggestions and recipe inspiration. Place the tomatoes on the baking sheet and drizzle with olive olive. Sprinkle with a generous pinch of kosher salt and pepper. Bake for 40 minutes, or until the tomatoes are wilted and the skin is wrinkled. Allow the tomatoes to cool slightly. Smear 1/2 tablespoon of pesto on each slice of ciabatta bread. Place a few slices of mozzarella on one half of the ciabatta roll. Top with roasted tomatoes and spinach. Place the other half of the roll on top. Cook on each side for 3-5 minutes, or until golden brown. Slice in half and serve immedieately. You can roast the tomatoes up to 3 days ahead of time. Store the cooled tomatoes in an airtight containter and place in the refrigerator until you’re ready to use. If you’re using a smaller tomato, such a grape or cherry, reduce the roasting time to 30 minutes. Roasted tomatoes are the bomb! And so are grilled cheese sandwiches. Together they are an awesome combo for sure. I am caprese obsessed! I never thought to turn it into a grilled cheese. Brilliant! It’s my favorite salad, so I knew I had to turn it in to a sammie. Thanks! I love your sandwich and your photography is beautiful! Oh wow – THIS is my favorite grilled cheese from today’s Sunday Supper! I love everything about it…yum! It doesn’t get much better than roasted tomatoes! Looks fantastic, and I love the new name and look!! This is a perfect grilled cheese. Everything I love in one awesome sammie!! Oh, how I can’t wait for summer! Thanks, Matea. How fun! This grilled cheese does make me happy and now I’m craving a big bite of this. I love roasting tomatoes – it resuscitates even out of season ones, or some that have bee on your counter too long. And next time I have to put them on a grilled cheese – looks amazing! Exactly, Brianne. Delicious tomatoes year ’round are just an oven-roasting session away. Thanks! Love the new look, new name and this amazing sandwich! I seriously fell in love with this when I saw it. Gosh it looks so rich and delicious! There is nothing better than roasted tomatoes, so this has to be the ultimate grilled cheese sandwich! Lovely idea for a grilled cheese… and with wine too- wahoo! Wine makes everything better. Thanks so much, Lori. Oh my gaaaaaah your site makeover is so beautiful!! I love the new name and everything about the design of your blog. Huge congrats, I know it’s a huge step! Wee! Thanks, Julia. Yes, hurry up and get yo’ grilled cheese sammie on. This is one scrumptious grilled cheese! I love that you added roasted tomatoes—so much deliciousness in them!!! I am all over this grilled cheese! Fresh roasted tomatoes rock here! No wonder we’re friends – you picked the very same two wines I would have chosen! I always see campari tomatoes in boxes at my grocery store, but have never bought them because I haven’t been sure what to use them for. Problem solved! Two peas, I tell ya :) Campari tomatoes are sweet like grape/cherry, only a little larger. I buy them in bulk at the Costco. This is my favoritest. I love it. love it. I want all the things in it. Thanks, Kayle! It’s my new sammie obsession. Thank you for this make at home version of one of my favorite Panera sammies!!! Your version looks sooo much better. I hate take out sandwiches because they never stay together. Also, looooove the new look and name of your site. Yay for spring blog revamps! The photos are stunning and I love the flavor combination! So much deliciousness in one sandwich! Thank you so much, Serena!